Panasonic was first to launch a portable DVD player in the UK, and has a great pedigree in the market. The DVD-LX97 is the flagship model in its latest range (alongside the lower-spec DVD-LS91) and its features list reads like a glossary of AV technology. 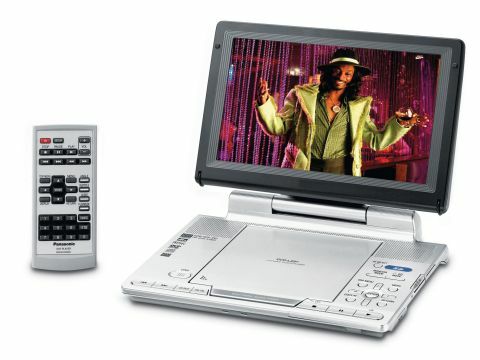 But most impressive is the LX97's design, which offers more viewing flexibility than your average portable DVD player. The 9in QVGA LCD screen flips open in the way you'd expect, but you can unclip it and lay it flat on the base. This not only makes it easy to adjust the screen's viewing angle, but also makes the unit more compact. What's more, the rechargeable battery pack is discreetly tucked away on the underside of the unit, which helps the DVD-LX97 maintain a slim profile. It offers four hours of playback time, increasing to six when you reduce the screen brightness, or 10 with the screen off. The base section houses a wide array of buttons but you also get a remote, which is well laid out and labelled. On the right side is an SD card slot that enables you to view JPEG images or MPEG4 clips, and on the left are composite video and audio input/outputs (the audio jack also offers optical digital audio output). Also supplied are two headphone jacks for simultaneous shared listening. So what about those features? Most eye-catching is the disc compatibility list, which includes DVD-Audio (in two-channel only), DVD-RAM, DVD-R/R (and their Dual/Double Layer versions) plus DVD-RW discs recorded in VR mode. DiVX playback will be music to the ears of download fans everywhere, while WMA and MP3 playback enable the LX97 to function as a makeshift music player. The onscreen menus are tidy and logical. Pressing 'Display' gives you access to a series of submenus that offer a surprisingly generous amount of picture and sound settings. Playback of Spielberg's War Of The Worlds DVD demonstrates its strengths perfectly - the images are pleasingly direct and forceful, with superb colours that really leap off the screen. The contrast range is also impressive, helping to deliver solid, cinematic pictures. It also ensures a superb performance during dark scenes from our test movie, such as the aliens' attack on the ferry. As the boat tips, you can clearly make out the falling people, and in the subsequent underwater scenes the clarity of objects in the gloominess is second to none. The Cinema 1 and Cinema 2 picture presets tweak contrast ever so slightly, but the overall effect isn't hugely beneficial. Only a couple of gripes rain on the parade - the screen isn't completely free from noise, which gives a subtle shimmering effect on dark colours, plus we were occasionally more aware of the screen's pixel structure than we'd have liked. Edges look a touch jagged, and the player struggles to resolve some small details. DiVX playback is smooth and problem free, with no lip sync issues, while sound quality is fantastic. The built-in speakers deliver a lot more bass than you'd expect, as the hearty alien foghorn blasts will testify, while dialogue, effects and music are all clean and audible. However, the various sound features do little to improve the overall ambience.